A number of senior arts officials have been fired by the new minister, who took office earlier in May. Egypt’s Culture Minister Alaa Abdel-Aziz dismissed the head of the Cairo Opera House on Tuesday. 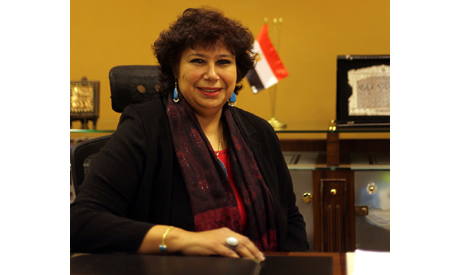 Ines Abdel-Dayem, who was appointed in 2012 by the previous minister for culture, told Ahram Arabic that she had not been informed of the reasons behind the decision, but that it comes as part of a “massacre” carried out by the new culture minister against the leadership of the culture ministry. Abdel-Aziz was appointed to his post in a Cabinet reshuffle in May. “It seems that the minister is implementing a specific vision and is working to achieve it with the utmost speed,” Abdel-Dayem said. “We have a minister whose experience is much less than that of many highly qualified artists and intellectuals,” she added. Abdel-Dayem said that as there are planned discussions on Tuesday at the Shura Council to reduce the budget allocated to the Cairo Opera House, her removal will leave no one to protect the already minimal budget that the opera house operates with. “There were no confrontations or disagreements between the minister and myself,” she said affirming that she would take legal action against the decision to dismiss her, as her contract expires in February 2014. Abdel-Dayem also told Ahram Online that the minister had announced that Reda El-Wakil, currently head of the Artistic House at the Cairo Opera House, will be appointed to the position. El-Wakil was unavailable for comment. “Since the minister’s appointment on 7 May, he has not tried to implement any culture policy. All he is doing is dismissing experienced artists from leading posts in Egypt’s culture scene,” Abdel-Dayem said. Abdel-Dayem is the third senior official within the culture ministry to be sacked since the minister took office three weeks ago. Her dismissal follows that of Ahmed Mujahid, head of the Egyptian General Book Authority, and Salah El-Meligy, head of the Fine Arts Sector, who was dismissed from his post on Monday, a decision that angered many visual artists who plan a protest against the decision. Said Tawfiq, secretary-general of the Supreme Council for Culture, offered his resignation when Abdel-Aziz came to office, but the minister rejected his offer and asked him to stay on. The minister also sent a note of dismissal of Sameh Mahran, head of the Academy of Arts, and officially accused him of defamation and harming the minister’s reputation. However, Mahran was not fired from his post as the head of the academy can only be dismissed by presidential decree.